Pascal Roge, International Concert pianist Par Excellence, returns to Cairns frequently to perform the Chamber Music that he loves with his wife, pianist Ami Hakuno, and Kirtley Leigh, violinist. Pascal opens with "La Fille au Cheveaux de Lin",or "The Girl with the Flaxen Hair", by way of his introduction of Leigh, and then speaks from the heart in a tribute to her creation and just why he loves performing here with us in Paradise! The trio welcomes you to enjoy everything that is special about the Paradise Concerts, and Kirtley and Pascal perform excerpts of their concert for the TV cameras. They are joined in the rainforest outside the rehearsal studio by an unlikely friend....attracted perhaps by the music soaring out across the balcony? Paradise Concerts is international classical chamber music at its very best. Now for 2016 in our 12th Season, we are presenting repertoire that audiences love, and world-class soloists that rouse the audience to cheering standing ovations time after time. Paradise Concerts is renowned for the intimate musical atmosphere at our recitals. We are re-creating the soirees of bygone times, and presenting them with flair and passion. The greatest works of classical composers for this genre are programmed, including music by the musical greats-Bach, Beethoven, Brahms, Mozart, Vivaldi, Schubert, Dvorak, and Mendelssohn. In addition, Paradise Concerts' recitals champion musical innovation and challenge, by composers such as Bartok, Kodaly, Grappelli, Schostakovich, Gershwin, Copeland, Ravel, Britten, and Franck. The concert recitals are illuminated by stories and background into the lives of each composer and their composition. This gives the audience a colourful backdrop with which to listen and savour each piece. The music literally comes alive, truly chamber music at its most exciting. A Paradise Concert is unique and memorable. We are passionate about the musical journey of each concert's programme and cordially invite you to indulge in a concert experience.Carnegie Hall is right here! Program Notes-Why is our Chamber Music so special....? Chamber Music is a dedicated genre of classical music that involves between 2- 9 musicians performing in an intimate, immensely rewarding and listener-friendly format. In the chamber music repertoire all musicians are soloists on their parts, creating a musical conversation between equals. Paradise Concerts presents chamber music at its very best. A chamber music performance is quite different to an orchestral performance - rather like the difference between attending a small dinner party with quiet one-to-one conversation, as opposed to an office cocktail party for 100! Paradise Concerts is renowned for the musical atmosphere at our recitals. The concerts re-create the soirees of bygone times, presenting them with flair and passion. Paradise Concerts champions musical innovation as well as honouring tradition and the beauty of musical form in the classical repertoire. This ranges from that of the Baroque master composers - Bach, Vivaldi, Handel, through the Classical era - Beethoven, Schubert, Mendelssohn, into the Romantic and Impressionistic compositions of Brahms, Dvorak, Debussy, Ravel, then 20th century music – Vaughan Williams, Britten, Shostakovich, Kodaly, Gershwin – and on to ground-breaking and specially commissioned 21st century scores, including a world-premiere Australian string quartet and a multi-media performance of photography set to “underwater” music celebrating the 2008 Year of the Coral Reef. 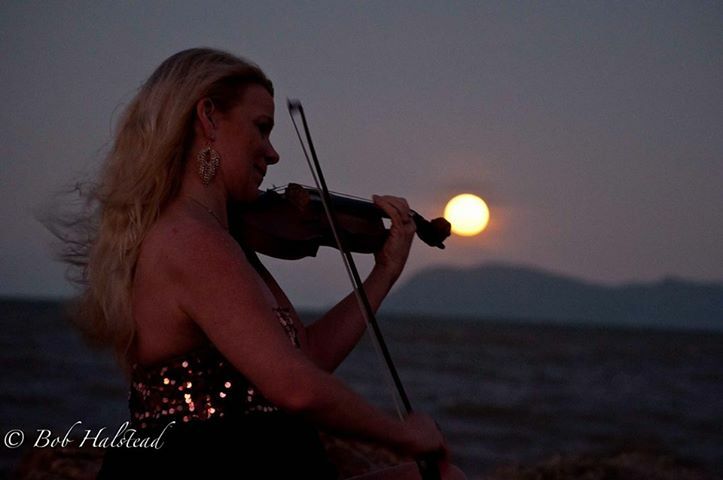 International Violinist Kirtley Leigh, newly arrived in Cairns from London, founded Paradise Concerts in 2003. It was designed to showcase her love of, and vast experience in, chamber music. Leigh involved international professional colleagues by bringing them to Cairns to perform together with talented Cairns-based professional musicians. The first Series was a success, each soiree performance in their home sold-out, and so the series moved on to larger venues. Past sponsors have included Paradise Palms, Shangri-La Hotel, Thala Beach Lodge, Hilton Cairns, and Kewarra Beach Resort, here finding the perfect duet between music and ambient tropical concert hall in the majestic rainforest. 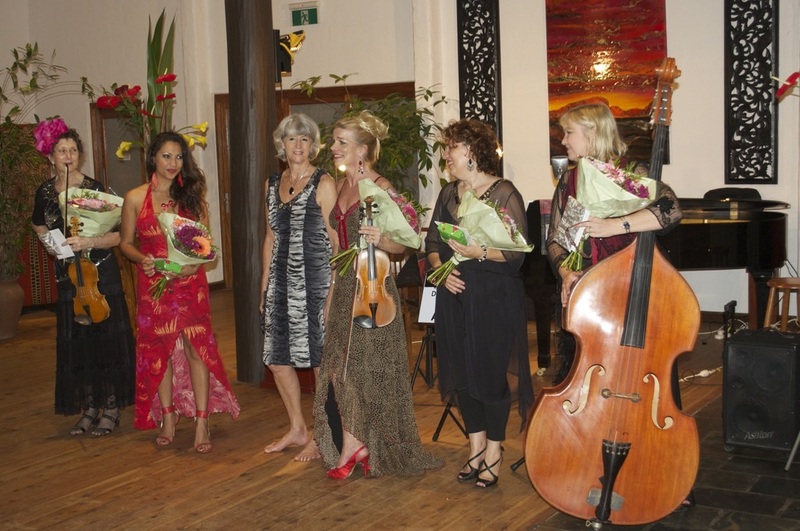 In our magical tropical settings, Paradise Concerts resounds throughout Australia, offering a wide variety of chamber music performances over the year. This unique music series is a pinnacle of quality culture in Cairns. We bring Carnegie Hall to Cairns. The list of international stars performing at past Paradise Concerts recital series include many world-class soloists- concert pianists Pascal Roge, Melvyn Tan, Ami Hakuno, Ambre Hammond, Clemens Leske, Benjamin Martin, James Brawn and Nan Gibson, cellists Markus Stocker, Gwyn Roberts, Louise King and Christine Jackson, Actress and Hollywood celebrity Diane Cilento, and Actor Kier Shorey, Photographer Bob Halstead, Singers Joy Power-Cleary, Kim Kirkman, and Katerini Manolatos, Composers Ross Carey and Rhonda Berry, and a bevy of fantastic string players including violinists/violists Kirtley Leigh, June Campbell, Caroline Lloyd-Doolan, Malcolm Cole, Khalida Foster, and Margaret Prestorius.There is also a host of lovely, loyal and local professionals who have made the chamber music special over the series. Concert highlights are many, including an 8 Seasons with Kirtley, Ami and Pascal,– the timeless Vivaldi and Piazzolla 4 Seasons, Baroque with Harpsichord, an electrifying Franck Sonata with the French pianist par excellence, Pascal Roge, Shakespeare at Karnak with Miss Cilento treading the boards, a standing ovation for an ethereal Lark Ascending with live tropical birds echoing the violin, Beethoven by Candlelight, The Four Divas, an opera extravaganza and Mozart for an audience of 250 with Melvyn Tan, the world’s foremost piano expert on the interpretation of that master. Oh, and did we mention the horn fanfare at the lake…? Artistic Director of Paradise Concerts, Kirtley, has over 30 years world- wide professional experience performing as violinist. The Paradise Concerts are introduced with informative narrative that illuminates the music, and brings the musicians who composed it, to life. This gives the audience a colourful backdrop with which to listen and savour each piece. The music literally comes alive, truly chamber music at its most exciting. The series has respected associations with an impressive range of key Australian cultural institutions, such as the Australian Festival of Chamber Music, Cairns Regional Council, Arts Queensland, Arts Nexus, ABC Far North Radio, Cairns Civic Theatre, Opera Queensland, Opera Australia, The Queensland Orchestra, Opera in the Outback (Undara), Karnak Playhouse and Theatre, Coca Centre of Contemporary Arts, CIAF, and Cairns Festival. Their international presence is confirmed since star performers keep returning to Paradise! Media attention is high too. Paradise Concerts has been featured virtually everywhere in the region, from the cover story of the 2008 Weekender Magazine, to WIN and Channel 7 TV News, to publications such as the Cairns Post, Tablelander, Cairns Sun, Time Out, Northern News, Pt. Douglas Gazette, Brisbane News, Gold Coast News, City Life, Arts Nexus Magazine, and as a Festival Cairns Highlight Performance. In 2007 Kirtley was awarded a RADF Honour by the Mayor in recognition of outstanding cultural excellence. The Mayor has returned to officially open each annual series. In 2009, Paradise Concerts was equally thrilled that Port Douglas was also host to the series, held each Sunday at the Historic Clink Theatre following the Saturday concerts at Kewarra Beach Resort. In 2010 we were invited to be the first chamber music series to perform at the newly restored historic Art Deco Innisfail Town Hall, and all Paradise Concerts' pianists are in love with the brand new concert Steinway in residence at that hall. We are passionate about the musical journey of each concert's programme and cordially invite you to indulge in a concert experience. A virtuoso series of performances awaits for the 2016 12th Anniversary – Series- let the celebrations begin!